New to VRBO Luxury Condo at a great price. This condo is located at Kuilima Estates West on the grounds of Turtle Bay Resort a 880 acre tropical paradise.Kuilima Estates is a gated community located on the North Shore of Oahu, commonly called the country and known for its laid back life style, pristine beaches, quirky shops and many fun places to enjoy a great meal.The Estates is surrounded by two championship golf courses. Some of the amenities available to guests include three swimming pools with a close radius to the apartment, each of which includes a barbeque area and gazebo. There are also tennis courts and facilities to host small gatherings.A short walk and you are at the Turtle Bay Hotel which has many fine restaurants, a great pool bar and magnificent beaches. There are many activities on the property that can be booked at the Hotel concierge desk, such as horse riding, surf lessons and helicopter rides. Golf can be booked at the golf pro shop which is also home to Lei Lei’s restaurant a favorite of locals. 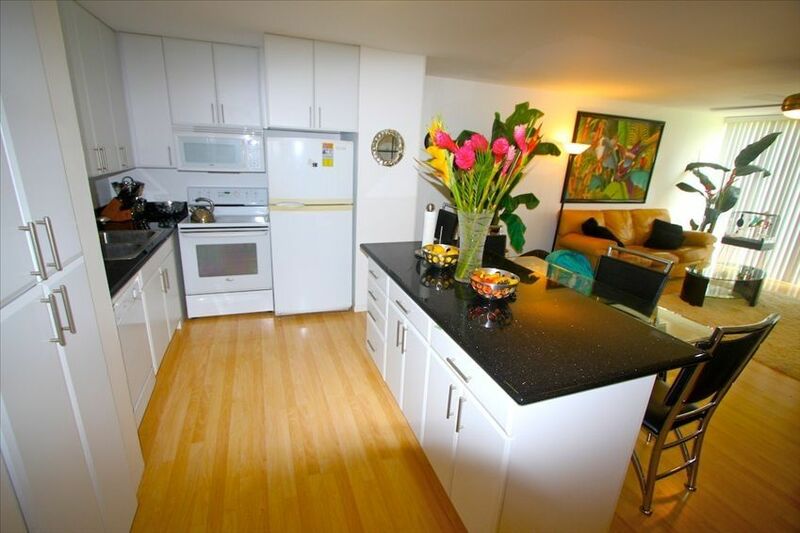 The condo itself is one bedroom one bath that has been extended to make the interior more spacious. The decor is tropical so you will feel right at home in Hawaii. The condo is fully furnished and has been completely remodeled with no expense spared. The living room has HDTV, DVD, WIFI and fold out couch for guests.The kitchen if fully equipped with top of the line appliances, granite counters, as well as quality utensils for those that like to cook. The bathroom has a Jacuzzi bathtub to relax in after a day swimming.The bedroom also has a television and DVD.To keep you cool on those hot days the condo is both fan cooled and air-conditioned.All you need is here. just bring your suit cases. We loved our stay here! There were just two of us and we stayed for a week. Helen was a wonderful hostess, reaching out to us with great instructions to get there and to make sure we settled in ok. She was very accommodating as to any questions we had or arrival times and she responded quickly if we did have any questions. The condo was just as pictured. It was well stocked with everything we needed and more. The area is beautiful and very quiet and private despite being near other condos. Overall, the condo is comfortable and homey. We would happily stay here again and highly recommend it! Perfect location stocked full of everything you need! Super friendly and attentive owner! The place was perfect for our family of 4. Location was great and the condo came stocked with everything we needed for the beach. We stayed a week and will definitely stay again. Well equipped, spacious very comfortable. Looked just the same as the photos. Helen was very good at responding to questions. We appreciated having an early check in. It was an enjoyable stay. Would be happy to stay there again. This is a beautiful, well equipped condo with everything you need. Great spot, excellent condo and even better host. Helen is awesome, and can help you with what every you need, from great trips on where to shop, and where to eat. Turtle bay has some beautiful beaches that are only minutes from condo. Could not more highly recommend this condo for your stay on the North Shore. We loved it here! The kitchen was well stocked with pots and pans, spices, cleaning supplies, etc. There was snorkeling gear, boogie boards, beach towels, etc! Those things saved us a lot of money in rental payments. The only thing that we would recommend would be an air conditioner in the living room area. Thank you for a wonderful stay! Tout était parfait avec un excellent suivi de la propriétaire. Je recommande vraiment. The condo is located on the grounds of Turtle Bay Resort and Hotel, The complex itself has three swimming pools, and two tennis courts as well as bar-b-que areas. Turtle Bay Resort is set on a large acreage of beaches and wild life. You can go for long walks, ride horses, take surfing lessons, basically most beach activities are available as well as golf and tennis.